Cloud Storage is a cloud computing model in which data is stored in the remote servers. With improving internet speed and other technologies, more and more data is moving to cloud storage. Having your data saved on cloud storage gives you the ability to access it anytime anywhere. There are many mainstream companies offering cloud storage but with recent data leaks and scandals, there is always a question of data privacy and safety. In this article, I will cover a free encrypted decentralized cloud storage. This free cloud service offers blockchain-based secure unlimited storage for the safekeeping of your important files and sensitive information. With blockchain at its back, this service provides you complete privacy and full control over your data. You don’t have to be concerned about the control of the service provider over your files, or data leakage which happened to many big companies recently. XOR Drive is a free encrypted decentralized cloud storage that is built upon the BlockStack platform. In order to use this service, you are required to have a BlockStack ID. If you don’t have a BlockStack ID, you can create one here. After creating a new ID or logging in with an existing ID, authorize the XOR Drive, and you are good to go. In case you have any difficulty getting around, you can find a video guide covering the signup and features in the XOR Drive Help section(Question-mark icon on the navigation panel). 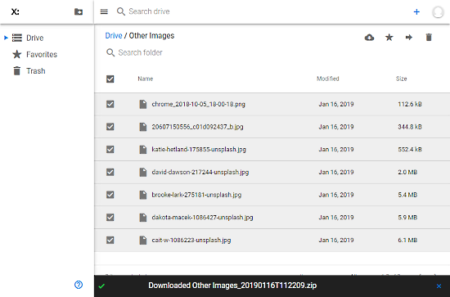 If you are using Google Drive, you find the user interface familiar. It seems like a scrap down version of Google Drive keeping only the essential features. This drive has a navigation panel on the left that has options to jump to Drive, Favorites, and Trash. The rest of the area is drive explorer where you can create folders, and upload files and folders. 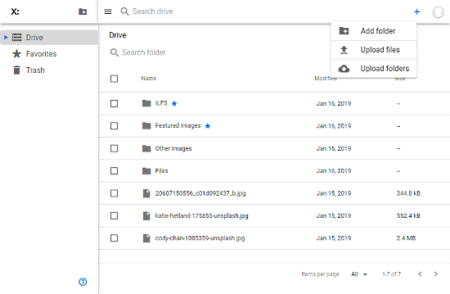 Similar to Google Drive, you can upload files and folders in bulk. You can add files by a simple drag and drop as well. Favorites: To add files and folders to your Favorites list. File Preview: Supports preview for text and multimedia files. Multiple Selection: To move, favorite, download, and delete multiple files at once. File Sharing: To share files with others on the web by generating a public file sharing link. Do note that, the File Sharing feature decrypts the files which you share otherwise it’s not possible to share them in a meaningful way. The files for which you enable the public sharing have a globe-shaped icon alongside their names to imply that. There is also a feature to share files privately with other BlockStack users which is said to be coming soon. Give XOR Drive a try here. XOR Drive offers encrypted and decentralized unlimited cloud storage where only have the control over your data. It uses blockchain-based identity to securely access files which ensures the data privacy and security. Check it yourself and share your thoughts with us in the comments.